It’s no secret that manufacturing facilities need to maintain a constant flow of working materials. Every manufacturing company wants to streamline their manufacturing process, from incoming raw materials to fabrication, packaging, and shipping. Interruption in the manufacturing process will inevitably decrease production. But, the right lift equipment can help maintain your workflow and streamline your production process. Maintaining a constant flow of materials in your production facility is not an impossible task. In fact, with the right tools it can be downright easy. As a benefit, you will improve profits by maximizing production and decreasing downtime using the appropriate lift equipment for your application. There’s obviously more to a proficient production process than lift equipment. But, when your workers are equipped with the right solutions, workflow and safety are greatly improved. There are dozens of overhead crane systems that will improve production and help to maintain a constant flow of working materials, but every application is different. Today, we are just going to discuss some universal solutions that can help keep your operation running at peak performance. If your facility is setup in workstations, your workers probably have to share a large overhead crane to move materials from one work area to another. 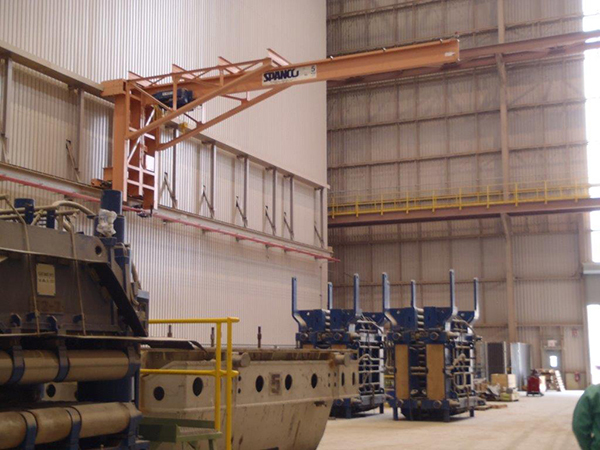 Waiting on the overhead crane creates unnecessary downtime, and although that large overhead crane is important to your operation, supplementing it with a series of wall-mounted or tie-rod jib cranes is a cost-efficient way to ensure each work area is equipped with an overhead lift system and downtime is eliminated. Wall-mounted jib cranes require no floor space and no special foundation. They quickly fold out of the way of large overhead cranes, offering the greatest amount of clearance above and below the boom. Tie-rod supported wall-mounted jib cranes are the most economical choice, and because they require no support structure under the boom, the trolley hoist can travel the full length of the boom. Tie-rod supported wall-mounted jibs are a great solution for the right facility, but the regular wall-mounted jib will transmit less direct force to your building columns than a tie-rod supported jib. Speak to an engineer or competent person to ensure your building structure can withstand the force of a wall-mounted crane. 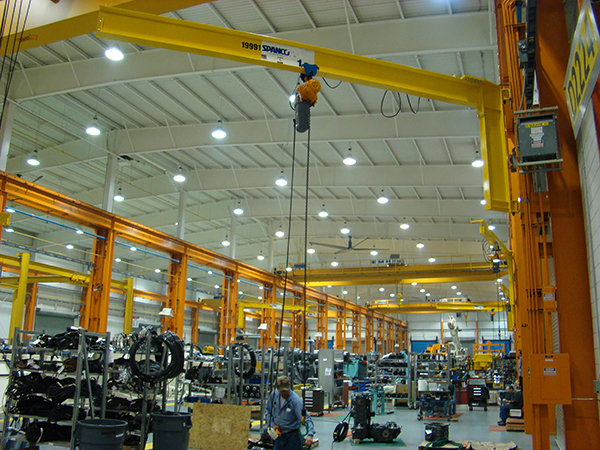 While wall-mounted jib cranes can be a great solution to supplement larger overhead cranes and provide easy lift for individual work areas, some facilities require an overhead crane that can span the distance of their entire facility. In this case, a workstation bridge crane can supplement or replace multiple jib cranes and forklifts. Ceiling-mounted workstation bridge cranes and monorails require no floor space and can cover the length of your entire building. 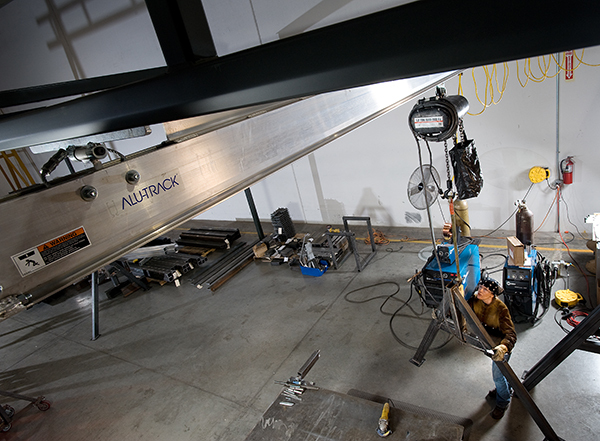 If your roof support structure can’t withstand the weight of a steel bridge crane, Alu-Track bridge cranes are designed with aluminum enclosed track for lightweight performance that’s durable, maintenance free, and non-corroding. The aluminum enclosed track reduces the overall system weight, so you can easily move the bridge crane throughout your entire facility. These systems are perfect for clean rooms, refrigerated areas and food packaging applications, moisture-laden environments, acidic environments, R&D labs, and wherever lightweight, durable enclosed track is required. For facilities that require indoor and outdoor portability, gantry cranes are the perfect solution to reduce downtime and provide lift from any location. This is especially true for aluminum gantry cranes, which can be assembled and disassembled quickly and easily for transportation from one job site to another or throughout your entire manufacturing plant. These durable lightweight gantries can lift up to three tons, while weighing as little as 116 pounds. Optional pneumatic tires make it easy to roll the crane over rough terrain, gravel, grass, dirt, or rooftops. 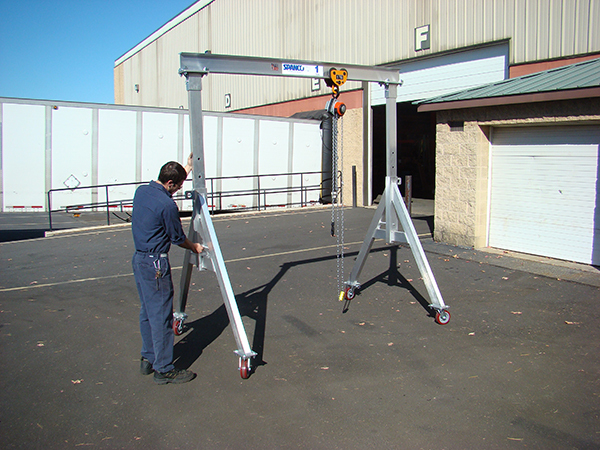 For manufacturing facilities that need to provide workers with long lateral movement of materials without taking up floor space or interfering with large overhead cranes, a wall-traveling jib crane may be the answer. Wall-traveling jibs increase overall plant productivity by quickly handling smaller lifts and covering an entire series of workstations using one agile system for (conceivably) the entire length of your building. Wall-traveling jibs are a cost-effective, custom engineered solution that can be specifically designed to meet your production needs and building specifications. Whichever overhead lift system meets the need of your facility, the cost of installing solutions like these will pay off in increased production, decreased downtime, and the overall safety of your workers.